Cardiff’s New Theatre’s 112th birthday coincides with the staging of a genre the theatre has always excelled at, the pantomime! For the 2018-19 season we have Beauty and the Beast, a production featuring an all-star cast, music, dance, romance thrills and high drama courtesy of incredible special effects. The tale follows the story of Belle and how she sets about to save the selfish Beast before the final petal of the enchanted rose falls. However, in order to save her beloved, Belle needs to overcome the Deadly Nightshade who controls life and death over The Beast, the Kraken beast that lurks in the castle and the oafish Clarence Bridge who will do anything to win Belle’s heart. 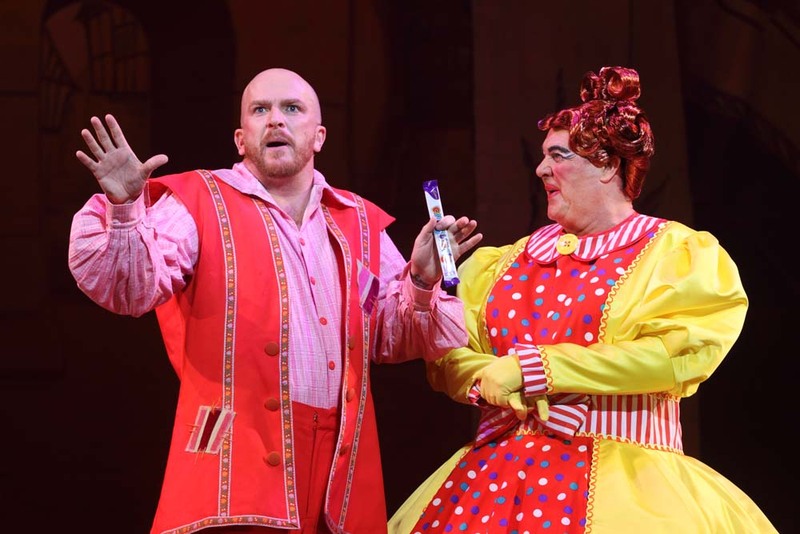 Edward Rowe and Mike Doyle star in Beauty and The Beast at Cardiff’s New Theatre from December 8 2018 - January 13 2019. All Phortgraphs by Brian Tarr. As in all pantomimes there are a colourful array of characters to delight the audience! Wales own Mike Doyle returns to the helm as panto dame, Kylie Kipling and delights with cheeky humour which is funny enough for the kids to enjoy, whilst evoking double entendre belly-laughs from the grown-ups..
Doyle’s performance of I Remember It Well with his bosom buddies Pinky and Perky undoubtedly goes down as one of the most surreal panto dame performances I’ve ever seen. His comedy routine later in a gym workout sequence led by Gareth “Alfie” Thomas doesn’t leave a dry eye among the audience! “I have all the right proportions, but not necessarily in the right places!” he observes, while the audience laugh and love every moment. Lisa Riley stars as Mrs Potts in Beauty and The Beast at Cardiff’s New Theatre from December 8 2018 - January 13 2019. All Photographs by Brian Tarr. Former Emmerdale star and Strictly Come Dancing contestant Lisa Riley leaps from a yellow limousine and twists and twirls on to the stage as the glamorous housekeeper Mrs Potts. Projecting a lot of bubbly fun from the stage, Miss Riley even gets a chance to strut her stuff with her dancing dream team to the Aretha Franklin classic, Respect! Danny Bayne and Gareth “Alfie” Thomas in Beauty and The Beast at Cardiff’s New Theatre from December 8 2018 - January 13 2019. All Photographs by Brian Tarr. 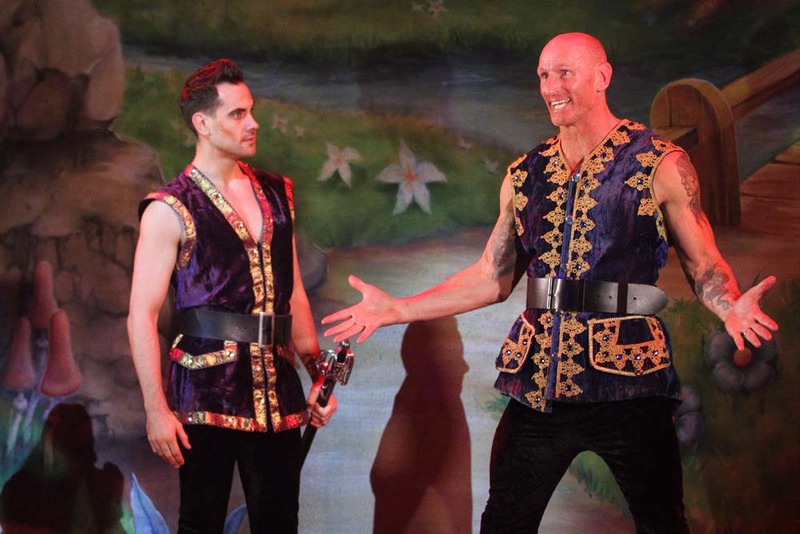 Gareth “Alfie” Thomas is always a fun addition to a panto presentation and as he arrives on the stage its clear his Welsh fans still love him. He quickly forms a short-lived double act with Danny Bayne’s Clarence Bridge as Bridge’s health and fitness trainer. “I spent five hours on the machine yesterday” exclaims Bayne as he is advised by Alfie on his new fitness regime. “Yes, the vending machine!” retorts Alfie, the jokes come thick and fast, as does the laughter. Danny Bayne gives an exceptional performance as Clarence Bridge, a muscular oaf who decides to lead the villagers to revolt and kill the beast. Bayne balances comedy with the right amount of drama that comes into full effect when he leads the song Kill The Beast! Danny Bayne and stephanie Webber in Beauty and The Beast at Cardiff’s New Theatre from December 8 2018 - January 13 2019. All Photographs by Brian Tarr. Stephanie Webber brings in the boos and hisses as the panto villain, the glamorous Deadly Nightshade, and at one point becomes totally believable as her stage persona as she disappears from the stage in a blaze of red light! Edward Rowe adds extra touches of comic buffoonery as Calvin Kipling (look out for his sweet stall sketch in which he recounts a story using every sweet product available on the market!). Naomi Slights and ensemble in Beauty and The Beast at Cardiff’s New Theatre from December 8 2018 - January 13 2019. All Photographs by Brian Tarr. Ben Richards and Naomi Slights drive the romance and thrills forward with their portrayals of The Beast and Belle as they sing the duet Rewrite The Stars (from The Greatest Showman). My favourite moment for the pair was seeing them do battle with the mighty Kraken which at one point appears to leave the stage and hover menacingly over the audience! Last, but certainly not least are the ensemble dancers, including the Lorri Guppy School of Dance who continually add to the colourful proceedings in a variety of eye catching costumes including salt and pepper pots, Candelabras and biscuits! 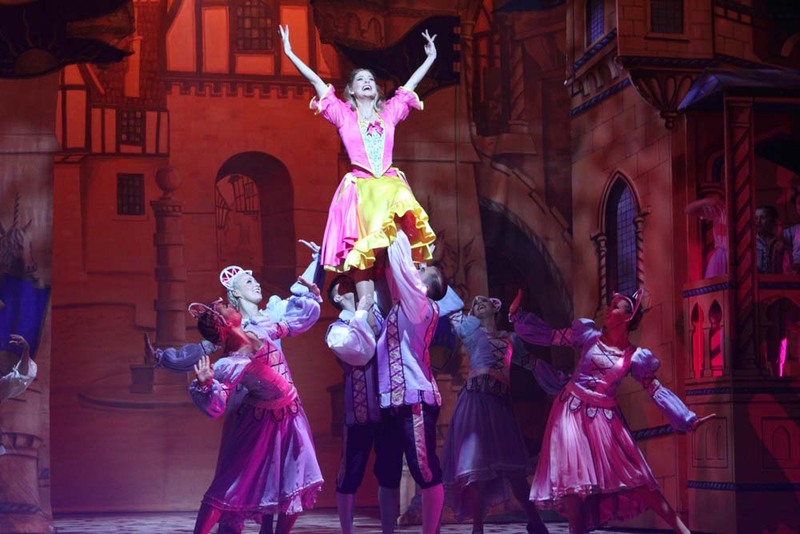 A magical production, Beauty and The Beast is the ultimate in panto experiences for the festive season. Dec 11 Music Legend Nile Rodgers Brings First CHIC Arena Tour To Wales!